Larco Engineering supply and fit a range of dock seals which have been manufactured with durability and performance in mind. Larco Engineering supply and fit a range of dock seals which have been manufactured with durability under the most adverse operating conditions and performance in mind. 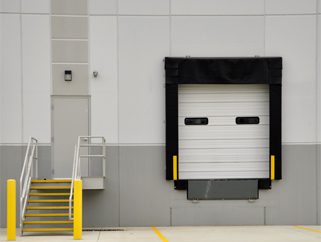 Our dock seals are designed to provide the maximum effective insulated sealing medium between the rear of the truck/trailer and the loading bay thereby helping to substantially reduce costs in relation to the heating or cooling of the building. Dock seals maintained by Larco Engineering provide protection from the wind and rain also. By reducing the amount of rain entering the internal areas of the loading bay our dock seals help to reduce the risks from people slipping and falling due to wet floors. As well as protecting your goods in transit, the seal also helps to increase productivity by preserving optimum working conditions for employees. Dock seals are also known as a dock shelter or dock shelters. Contact Larco Engineering today on (0)21 2061 406 to discuss your Dock Seal and Dock Shelter requirements.